Received: October 16, 2018; Revised: November 8, 2018; Accepted: November 13, 2018; Published online: December 6, 2018. Myeloid-derived suppressor cells (MDSCs) that are able to suppress T cell function are a heterogeneous cell population frequently observed in cancer, infection, and autoimmune disease. Immune checkpoint molecules, such as programmed death 1 (PD-1) expressed on T cells and its ligand (PD-L1) expressed on tumor cells or antigen-presenting cells, have received extensive attention in the past decade due to the dramatic effects of their inhibitors in patients with various types of cancer. In the present study, we investigated the expression of PD-1 on MDSCs in bone marrow, spleen, and tumor tissue derived from breast tumor-bearing mice. Our studies demonstrate that PD-1 expression is markedly increased in tumor-infiltrating MDSCs compared to expression in bone marrow and spleens and that it can be induced by LPS that is able to mediate NF-κB signaling. 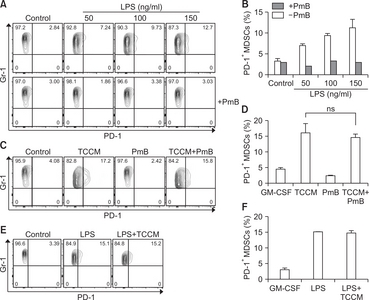 Moreover, expression of PD-L1 and CD80 on PD-1+ MDSCs was higher than on PD-1− MDSCs and proliferation of MDSCs in a tumor microenvironment was more strongly induced in PD-1+ MDSCs than in PD-1− MDSCs. Although we could not characterize the inducer of PD-1 expression derived from cancer cells, our findings indicate that the study on the mechanism of PD-1 induction in MDSCs is important and necessary for the control of MDSC activity; our results suggest that PD-1+ MDSCs in a tumor microenvironment may induce tumor development and relapse through the modulation of their proliferation and suppressive molecules. Immune checkpoint molecules are regulators of immune activation and include cytotoxic T-lymphocyte–associated antigen 4 (CTLA-4), lymphocyte-activation gene 3 (LAG-3), programmed cell death protein 1 (PD-1), T-cell immunoglobulin and mucin-domain containing-3 (TIM-3), and B and T lymphocyte attenuator (BTLA). They are expressed on the surface of immune cells and contribute to the negative regulation and maintenance of tolerance. PD-1 (CD279), expressed on activated T cells, NK cells, and B cells, is one of the immune checkpoint molecules and is a 288 amino acid protein and a member of the CD28 superfamily (Bai et al., 2017). Its expression has been best studied in T cells, and it plays a critical role in lymphocyte homeostasis. Programmed death-ligand 1 (PD-L1; B7-H1; CD274) and programmed death-ligand 2 (PD-L2; B7-DC; CD273), the ligands for PD-1, are expressed on antigen-presenting cells (APCs), and non-hematopoietic cells, including cells in many tissues and tumor cells. Interaction of PD-1 with its ligands can induce an inhibitory signal and exert important biological effect within tissues and tumors (Shin and Jin, 2017). For instance, in activated T cells, PD-1 signaling by PD-L1 or PD-L2 on APCs can protect the cells from an autoimmune response (Zamani et al., 2016). In addition, tumor cells use the signal as a mechanism for immune escape. 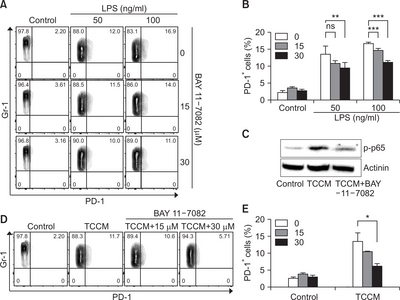 PD-1 signaling leads to the dysfunction of T cells by inhibiting the T cell receptor (TCR) and co-stimulatory signals following T cell apoptosis through various mechanisms. PD-L-engaged PD-1 strongly counteracts TCR signal transduction and CD28 co-stimulation by interfering with three downstream pathways including the following effects: i) inhibition of TCR signaling molecules, such as Lck and ZAP-70 phosphorylation; ii) inhibition of PI3K-Akt pathway; and iii) inhibition of Ras-MEK-ERK pathway. These mechanisms lead to a change in T cell-related gene expression, including interferon γ (IFNγ), basic leucine zipper transcription factor (BATF), tumor necrosis factor α (TNFα), and interleukin-2 (IL-2) expression. In addition, PD-1 expression on tumor-infiltrating T cells is associated with an attenuated antitumor response and exhaustion (Ahmadzadeh et al., 2009; Leung and Suh, 2014; Daud et al., 2016). Myeloid-derived suppressor cells (MDSCs) are defined as immature myeloid cells and include two major subsets of monocyte-like MDSC (MO-MDSC) and polymorphonuclear MDSC (PMN-MDSC). Both subsets have immune suppressive functions. Chronic inflammation and tumor progression could induce an expansion and suppressive activity of MDSCs. MDSCs generated from bone marrow (BM) can migrate into a tumor lesion in response to chemokines including CCL2 and CCL5 (Huang et al., 2007), and MDSCs then promote tumor progression by inhibiting T cells and NK cells as well as inducing regulatory T cells (Treg cells) in a tumor microenvironment. A number of studies have shown that the infiltration of MDSCs correlates with cancer progression and poor prognosis (Gabrilovich et al., 2012; Draghiciu et al., 2015). Earlier studies have reported that PD-1 is not expressed on myeloid cells, such as macrophages and dendritic cells (Yamazaki et al., 2002). However, recent evidence suggests that PD-1 expression on myeloid cells plays an important role in immune function (Yao et al., 2009; Said et al., 2010; Zhang et al., 2010). Furthermore, there is emerging evidence that PD-1 expression on tumor-infiltrating immune cells, such as tumor-infiltrating dendritic cells (TIDC) and tumor-associated macrophages (TAMs), is involved in the control of their function (Karyampudi et al., 2016). Although PD-1 is also expressed on the surface of MDSCs from patients with chronic hepatitis B virus infection (Huang et al., 2014), its exact role in the tumor microenvironment still remains to be explored. In the present study, we demonstrate that PD-1 expression was increased in tumor-infiltrating MDSCs through NF-κB signaling. Moreover, a proliferation of MDSCs in the tumor microenvironment and expression of immune suppressive molecules on the surface of MDSCs were more strongly induced in PD-1+ MDSCs than in PD-1− MDSCs. These findings may provide PD-1+ MDSCs as new target cells in the treatment of cancer and have implications for the use of PD-1 blockade in therapeutic strategies for cancer immune therapy. 4T1 cells were maintained in complete Dulbecco’s Modified Eagle’s Medium (DMEM; Gibco/Invitrogen, Carlsbad, CA, USA) supplemented with 10% heat-inactivated fetal bovine serum (FBS) (Gibco/Invitrogen) and 1% penicillin/streptomycin. Cells were maintained in an atmosphere of 5% CO2 in a 37°C humidified incubator. Female Balb/c mice at 6 to 8 weeks of age were purchased from Samtaco (Osan, Korea). Tumor models were generated by subcutaneous injection of 5×105 4T1 cells (Balb/c mice). Detectable tumors were isolated at day 14 after 4T1 tumor inoculation since number of MDSCs rapidly increased after the time period, and more importantly, tumor metastasis was not observed. The tumors was collected and minced into single cells by using glass plunger. The cell suspension was then passed through a 70-µm cell strainer and gated for the analysis of PD-1 and Gr-1 expression by staining with anti-CD45 antibody. The tumor-bearing mice were sacrificed humanely within a month. The mice were maintained in the specific pathogen-free facilities at Sookmyung Women’s University. All animal experiments were performed in accordance with the guidelines of the Institutional Animal Care and Use Committee, after approval by the Institutional Ethic Committee of Sookmyung Women’s University (Resolution No. SMWU-IA-CUC-1410-018-01). 4T1 cells were maintained in complete medium for 48 h and the cell supernatant was collected when cells were 80% confluent. To obtain enriched proteins, TCCM was concentrated at 300 g for 20 min at 4°C using a 3000 NMWL (nominal molecular weight limit) centrifugal filter (Merck Millipore, Billerica, MA, USA). Bone marrow cells were obtained from the femurs of Balb/c mice. BM cells were treated with RBC lysing buffer (Sigma-Aldrich, St. Louis, MO, USA) for depletion of red blood cells. Next, the remaining cells were stained with an antibody against CD11b (M1/70, eBioscience, San Diego, CA, USA) for CD11b+ cell sorting using a S3TM Cell Sorter (Bio-Rad Laboratories, Hercules, CA, USA). The sorted CD11b+ cells were cultured in RPMI 1640 supplemented with 10% heat-inactivated FBS in the presence of 10 ng/ml GM-CSF, in the absence or presence of 50 ng/ml LPS and TCCM in an atmosphere of 5% CO2 in a 37°C humidified incubator. The cells were collected on day 4 for cell analysis. The BM-MDSCs were lysed in Pro-PrepTM reagent (iNtRON Biotechnology, Seongnam, Korea) for 30 min on ice. For immunoblotting, equivalent cell lysates were mixed with 5X sample buffer and separated by 12% SDS-polyacrylamide gel electrophoresis. The separated proteins were transferred onto a PVDF membrane (Amersham Biosciences, Burkes, UK). The membrane was incubated in 3% BSA for 1 h for blocking. The washed membrane was incubated with primary antibody overnight at 4°C. Antibodies against phospho-NF-κB p65 and actinin were purchased from Cell Signaling Technology Inc. (Beverly, MA, USA) and Santa Cruz Biotechnology (Santa Cruz, CA, USA), respectively. For the secondary antibody incubation, the membrane was washed with TBST and stained with respective anti-rabbit and anti-mouse secondary antibodies from Santa Cruz Biotechnology and Sigma-Aldrich for 2 h at room temperature. Next, the membrane was washed and the proteins were visualized with enhanced chemiluminescence (PicoEPDTM Western Reagent Kit, ELPIS-Biotech, Daejeon, Korea) and analyzed using an LAS-3000 imaging system (FUJIFILM Corporation, Tokyo, Japan). Red blood cells were removed from splenocytes and bone marrow cells using red blood cell lysing buffer (Sigma-Aldrich). Surface staining of Gr-1 (RB6/8C5, eBioscience), CD11b (M1/70, eBioscience), PD-1 (J43, eBioscience), and CD45 (30-F11, Tonbo Biosciences, San Diego, CA, USA) was performed using fluorochrome-conjugated mAbs at 4°C for 30 min. The cells were washed twice with PBS. The samples were analyzed using a FACSCanto IITM flow cytometer (BD Biosciences, San Jose, CA, USA). The flow cytometry data were analyzed by FlowJo software (Tree Star, Ashland, OR, USA). CD11b+ cells obtained from Balb/c mice were sorted using a S3TM Cell Sorter. Sorted CD11b+ cells were stained using an antibody (M1/70, eBioscience) with 2.5 µM CFSE for 7 min at room temperature using a CellTraceTM CFSE Cell Proliferation Kit (Molecular Probes, Eugene, OR, USA). Dead cells were gated out by particle size on the FSC vs SSC density plot. An equal volume of FBS was added into CD11b+ cells and incubated for 3 min. After two washes, the cells were cultured in RPMI 1640 supplemented with 10% heat-inactivated FBS in the presence of 10 ng/ml GM-CSF and TCCM for 4 days. The cells were stained with an antibody against Gr-1 (RB6/8C5), CD11b (M1/70), PD-1 (J43, eBioscience), and then the CFSE+ MDSCs were analyzed by flow cytometry. Although recent works have shown that PD-1 is expressed on both mouse CD11c+ TIDCs in murine models of ovarian cancer and mouse Gr-1+CD11b+ MDSCs from ascites and spleen of mice bearing ovarian carcinoma cells (Liu et al., 2009; Karyampudi et al., 2016), it remains unclear whether PD-1 expression on MDSCs in a tumor microenvironment is increasingly detectable over the course of cancer progression in general. To determine whether PD-1 expression on MDSCs is affected by breast tumor condition, 4T1 breast cancer cells were injected into mice, and then PD-1 expression on MDSCs from spleen and tumors of mice was evaluated by flow cytometry. We found that PD-1 was more highly expressed on MDSCs from tumors than on those from spleens (Fig. 1A, 1B). To investigate the origin of PD-1+ MDSCs in tumors, we analyzed MDSCs from bone marrow, spleens, and tumors. Interestingly, PD-1 was not expressed on MDSCs of bone marrow. Although PD-1 was expressed on MDSCs from spleens, its expression level was low compared with that of MDSCs from tumors and did not depend on tumor progression. However, the percentage of PD-1+ MDSCs from tumors was gradually increased in relation to tumor development (Fig. 1C, 1D). These data show that whereas PD-1-positive MDSCs in bone marrow obtained from tumor-bearing mice were rare, PD-1 expression was increased in tumor-infiltrating MDSCs, suggesting PD-1+ MDSCs may play an important role in the tumor microenvironment. To investigate whether PD-1 expression is specifically regulated by tumors, we induced MDSC differentiation from bone marrow cells in vitro by adding GM-CSF or GM-CSF plus TCCM to the culture. 4T1-induced TCCM is used as a tumor microenvironment in vitro (Nam et al., 2016). Consistent with previous data, PD-1 expression was increased only in TCCM-treated BM-MDSCs (Fig. 2A, 2B). IL-6 treatment, which has been known to induce the activation of MDSCs (Jiang et al., 2017), did not affect the level of PD-1 expression, indicating that some specific factor in the tumor microenvironment may regulate PD-1 expression on MDSCs. Next, we evaluated whether PD-1 expression on MDSCs was induced in a time- and dose-dependent manner based on tumor condition. BM cells were treated with TCCM in the presence of GM-CSF according to the exposure time and concentration of TCCM. As shown in Fig. 2C and 2D, TCCM enhanced the population of PD-1+ MDSCs in a concentration-dependent manner, and this effect was obvious after 3 or 4 days of incubation with TCCM. It has been reported that some factors of the tumor microenvironment transfer signals through binding to receptors on MDSCs (Trikha and Carson, 2014). To examine whether PD-1 expression on MDSCs was directly regulated by tumor-derived factors, BM-MDSCs were co-cultured with 4T1 breast cancer cells. BM-MDSCs directly contacting 4T1 breast cancer cells showed similar levels of PD-1 expression compared to the effects of TCCM treatment (Fig. 2E, 2F). These findings suggest that some soluble factors provided by the tumor microenvironment may be sufficient to induce PD-1 expression on MDSCs through interaction with their receptor on MDSCs. To examine the difference between the PD-1+ MDSC and PD-1− MDSC populations, we first measured the expression levels of CD80 and PD-L1 in both populations. Compared to BM-MDSCs treated with GM-CSF alone or in combination with IL-6, TCCM-treated cells showed enhanced ratios of CD80- or PD-L1-positive MDSCs (Fig. 3A, 3B). Furthermore, when PD-1-high and PD-1-low cells were separately analyzed for PD-L1 or CD80 expression, a significantly higher increase in PD-L1 or CD80 expression was observed in PD-1+ MDSCs than in PD-1− MDSCs (Fig. 3C, 3D). These results indicate that expression of immune suppressive molecules, such as PD-L1 and CD80, is more strongly induced in PD-1+ MDSCs than in PD-1− MDSCs. The proliferation and accumulation of MDSCs promote tumor progression (Draghiciu et al., 2015). To investigate whether PD-1 is involved in MDSC proliferation, BM-MDSCs were labeled with CFSE, and proliferation of MDSCs after gating of PD-1− MDSCs and PD-1+ MDSCs was evaluated by flow cytometry. Interestingly, the ratio of proliferating CFSE-labeled MDSCs was higher in PD-1+ MDSCs than in PD-1− MDSCs in both control and TCCM conditions (Fig. 4A). However, the difference in proliferation between PD-1+ MDSCs and PD-1− MDSCs was more significant in the TCCM-treated group (Fig. 4A, 4B). These findings indicate that PD-1 may be involved in MDSC proliferation and that the proliferation of PD-1+ MDSCs is partly affected by the tumor microenvironment, leading to an increase in the number of PD-1+ MDSCs. Thus, the tumor microenvironment seems to increase the numbers of MDSCs by inducing PD-1 expression, leading to tumor progression. It has been reported that PD-1 expression on macrophages is increased by stimulation with TLR ligands (Bally et al., 2015). To confirm the change of PD-1 expression on MDSCs caused by lipopolysaccharide (LPS) treatment, BM-MDSCs were treated with LPS in the absence and presence of polymyxin B (PmB), which is used as an antibiotics to inhibit the biological activities of lipopolysaccharide from gram-negative bacteria. As expected, LPS treatment, but not in the presence of PmB, increased PD-1 expression in a dose-dependent manner (Fig. 5A, 5B). In addition, when BM-MDSCs were cultured with TCCM in the presence of PmB, PmB treatment did not affect the level of PD-1 expression, suggesting that LPS signaling was needed for induction of PD-1 expression, and TCCM increased PD-1 expression independent of signaling mediated by an LPS-like ligand (Fig. 5C, 5D). We next investigated a synergistic effect between LPS and TCCM. The percentage of PD-1+ BM-MDSCs was not changed by co-treatment with LPS and TCCM compared with the effect of LPS alone (Fig. 5E, 5F). These data suggest the possibility that both LPS and some factors in the tumor microenvironment transmit a signal through the common downstream pathway. Many studies have shown that NF-κB in MDSC is associated with accumulation and function of MDSCs (Condamine and Gabrilovich, 2011). We investigated whether PD-1 expression on MDSCs was affected in a manner dependent on the NK-κB signaling pathway because NF-κB is well known as a downstream signal associated with LPS. In the present study, BAY 11-7082, which is an NF-κB-specific inhibitor, was used. LPS-induced PD-1 expression on MDSC was significantly decreased by BAY 11-7082 treatment although we did not observe a complete inhibition of LPS-induced PD-1 expression after the treatment with the NF-κB inhibitor (Fig. 6A, 6B). Furthermore, we confirmed that BAY 11-7082 treatment significantly inhibits the phosphorylation of p65 (Fig. 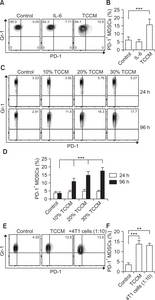 6C) and the increase in PD-1 expression on MDSCs under TCCM conditions (Fig. 6D, 6E). Collectively, these data suggest that PD-1 expression on MDSCs in the tumor microenvironment can be regulated by the NK-κB signaling pathway. In the present study, we confirmed that PD-1 expression was increased in tumor-infiltrating MDSCs. The MDSCs generated from BM rarely express PD-1. However, MDSCs that have migrated into other tissues and tumor tissues showed dramatically increased levels of PD-1 expression (Fig. 1). It is possible to predict that PD-1 on MDSCs plays an important role in specific conditions, such as at inflammatory sites. Actually, some specific makers are only expressed on activated MDSCs under the tumor microenvironment (Umansky et al., 2016). Tumor-associated macrophages (TAMs) are known as M2-polarized macrophages and correlate with a poor prognosis in cancer. They can promote tumor angiogenesis, metastasis, and invasion (Yang and Zhang, 2017). TAMs more closely resemble MDSCs, and some studies have even suggested that MDSCs may differentiate into TAMs at inflammatory sites (Kumar et al., 2016). Interestingly, a recent study has reported that PD-1 is strongly expressed on TAMs from the tumor microenvironment and participates in tumor progression (Gordon et al., 2017). Our study showed that the number of proliferating PD-1+ MDSCs was higher than that of PD-1− MDSCs. Interestingly, expression of PD-L1 or CD80 was higher in the PD-1+ MDSC population compared to the PD-1− MDSC population, suggesting an essential role of PD-1+ MDSCs in transducing inhibitory signals in T cells. CD80 ligates either CD28, in a co-stimulatory fashion, or CTLA-4, which transduces inhibitory signals in T cells. In fact, it has been reported that the expression of CD80 normally found on dendritic cells or macrophages was increased on MDSCs in patients with malignant melanoma, and it was also upregulated on MDSCs in a murine ovarian cancer model, and its ligation of CTLA-4 on Treg was crucial for T cell suppression (Yang et al., 2006; Poschke et al., 2010). The tumor microenvironment consists of various types of cells, such as tumor cells, stromal cells, and infiltrating immune cells. A number of cytokines, chemokines, and other soluble factors secreted by the various cells act on target cells individually. For instance, interleukin-18 (IL-18), one of the many cytokines in the tumor microenvironment, can be induced by immune cells and cancer cells (Robertson et al., 2006). IL-18 induces a cell-mediated immune response to activate macrophages or other cells. In contrast, it also shows an ability to allow tumor progression (Fabbi et al., 2015). Interestingly, IL-18 induces PD-1 expression on NK cells leading to tumor progression through an escape from immune surveillance against cancer (Terme et al., 2011). Thus, to investigate whether IL-18 also induces PD-1 expression on MDSCs, BMMDSCs were treated with recombinant IL-18. Contrary to our expectation, PD-1 expression was not changed in spite of the presence of high concentrations of IL-18 (Supplementary Fig. 1A). Finally, we also confirmed that LPS induces PD-1 expression on MDSCs via the NF-κB signaling pathway. The NF-κB signaling pathway in MDSCs has already been reported as an important mechanism by which MDSCs are induced to differentiate and can be activated. The activation of NF-κB signaling is also induced by TNFα and IL-1 as well as LPS (Hoesel and Schmid, 2013). TNFα and IL-1 are pleiotropic cytokines and have been implicated as a factor in tumor progression (Lewis et al., 2006; Landskron et al., 2014). In addition, they are most likely related with MDSC activation (Tu et al., 2008; Hu et al., 2014). S100A8/9 has also been demonstrated to induce MDSC accumulation and activation through the NF-κB signaling pathway (Sinha et al., 2008; Condamine and Gabrilovich, 2011). However, when we evaluated the effect of TNFα, IL-1, and S100A8/9 on PD-1 expression on MDSCs, all of them, similar to IL-18, did not affect PD-1 expression level on MDSCs (Supplementary Fig. 1B–1D). Although we found in this study that PD-1 expression on MDSCs could be modulated by soluble factor(s) derived from 4T1 breast cancer cells that can transduce NF-κB-dependent signaling, we were not able to characterize the inducer of PD-1. Therefore, performing a study on the mechanism of PD-1 induction in MDSCs is important and necessary for understanding the control of MDSC activity because our results suggest that PD-1+ MDSCs in the tumor microenvironment may induce tumor development and relapse through the modulation of suppressive molecules and cell proliferation. Based on these findings, we presume that PD-1 expression on MDSCs in the tumor microenvironment may play a negative role in tumor immunity, and therefore, inhibition of PD-1 as well as PD-L1 on MDSCs may be crucial for potentiating clinical benefits in certain types of tumors, such as breast cancer. This research was supported by a grant of the Korea Health Technology R&D Project through the Korea Health Industry Development Institute (KHIDI), funded by the Ministry of Health & Welfare, Republic of Korea (grant number : H18C1244). Ahmadzadeh, M, Johnson, LA, Heemskerk, B, Wunderlich, JR, Dudley, ME, White, DE, and Rosenberg, SA (2009). Tumor antigen-specific CD8 T cells infiltrating the tumor express high levels of PD-1 and are functionally impaired. Blood. 114, 1537-1544. Bai, J, Gao, Z, Li, X, Dong, L, Han, W, and Nie, J (2017). Regulation of PD-1/PD-L1 pathway and resistance to PD-1/PD-L1 blockade. Oncotarget. 8, 110693-110707. Bally, AP, Lu, P, Tang, Y, Austin, JW, Scharer, CD, Ahmed, R, and Boss, JM (2015). NF-kappaB regulates PD-1 expression in macrophages. J. Immunol. 194, 4545-4554. Condamine, T, and Gabrilovich, DI (2011). Molecular mechanisms regulating myeloid-derived suppressor cell differentiation and function. Trends Immunol. 32, 19-25. Daud, AI, Loo, K, Pauli, ML, Sanchez-Rodriguez, R, Sandoval, PM, Taravati, K, Tsai, K, Nosrati, A, Nardo, L, Alvarado, MD, Algazi, AP, Pampaloni, MH, Lobach, IV, Hwang, J, Pierce, RH, Gratz, IK, Krummel, MF, and Rosenblum, MD (2016). Tumor immune profiling predicts response to anti-PD-1 therapy in human melanoma. J. Clin. Invest. 126, 3447-3452. Draghiciu, O, Lubbers, J, Nijman, HW, and Daemen, T (2015). Myeloid derived suppressor cells-An overview of combat strategies to increase immunotherapy efficacy. Oncoimmunology. 4, e954829. Fabbi, M, Carbotti, G, and Ferrini, S (2015). Context-dependent role of IL-18 in cancer biology and counter-regulation by IL-18BP. J. Leukoc. Biol. 97, 665-675. Gabrilovich, DI, Ostrand-Rosenberg, S, and Bronte, V (2012). Coordinated regulation of myeloid cells by tumours. Nat. Rev. Immunol. 12, 253-268. Gordon, SR, Maute, RL, Dulken, BW, Hutter, G, George, BM, McCracken, MN, Gupta, R, Tsai, JM, Sinha, R, Corey, D, Ring, AM, Connolly, AJ, and Weissman, IL (2017). PD-1 expression by tumour-associated macrophages inhibits phagocytosis and tumour immunity. Nature. 545, 495-499. Hoesel, B, and Schmid, JA (2013). The complexity of NF-kappaB signaling in inflammation and cancer. Mol. Cancer. 12, 86. Hu, X, Li, B, Li, X, Zhao, X, Wan, L, Lin, G, Yu, M, Wang, J, Jiang, X, Feng, W, Qin, Z, Yin, B, and Li, Z (2014). Transmembrane TNF-alpha promotes suppressive activities of myeloid-derived suppressor cells via TNFR2. J. Immunol. 192, 1320-1331. Huang, A, Zhang, B, Yan, W, Wang, B, Wei, H, Zhang, F, Wu, L, Fan, K, and Guo, Y (2014). Myeloid-derived suppressor cells regulate immune response in patients with chronic hepatitis B virus infection through PD-1-induced IL-10. J. Immunol. 193, 5461-5469. Huang, B, Lei, Z, Zhao, J, Gong, W, Liu, J, Chen, Z, Liu, Y, Li, D, Yuan, Y, Zhang, GM, and Feng, ZH (2007). CCL2/CCR2 pathway mediates recruitment of myeloid suppressor cells to cancers. Cancer Lett. 252, 86-92. Jiang, M, Chen, J, Zhang, W, Zhang, R, Ye, Y, Liu, P, Yu, W, Wei, F, Ren, X, and Yu, J (2017). Interleukin-6 trans-signaling pathway promotes immunosuppressive myeloid-derived suppressor cells via suppression of suppressor of cytokine signaling 3 in breast cancer. Front. Immunol. 8, 1840. Karyampudi, L, Lamichhane, P, Krempski, J, Kalli, KR, Behrens, MD, Vargas, DM, Hartmann, LC, Janco, JM, Dong, H, Hedin, KE, Dietz, AB, Goode, EL, and Knutson, KL (2016). PD-1 Blunts the Function of Ovarian Tumor-Infiltrating Dendritic Cells by Inactivating NF-kappaB. Cancer Res. 76, 239-250. Kumar, V, Patel, S, Tcyganov, E, and Gabrilovich, DI (2016). The nature of myeloid-derived suppressor cells in the tumor microenvironment. Trends Immunol. 37, 208-220. Landskron, G, De la Fuente, M, Thuwajit, P, Thuwajit, C, and Hermoso, MA (2014). Chronic inflammation and cytokines in the tumor microenvironment. J. Immunol. Res. 2014, 149185. Leung, J, and Suh, WK (2014). The CD28-B7 family in anti-tumor immunity: emerging concepts in cancer immunotherapy. Immune Netw. 14, 265-276. Lewis, AM, Varghese, S, Xu, H, and Alexander, HR (2006). Interleukin-1 and cancer progression: the emerging role of interleukin-1 receptor antagonist as a novel therapeutic agent in cancer treatment. J. Transl. Med. 4, 48. Liu, Y, Yu, Y, Yang, S, Zeng, B, Zhang, Z, Jiao, G, Zhang, Y, Cai, L, and Yang, R (2009). Regulation of arginase I activity and expression by both PD-1 and CTLA-4 on the myeloid-derived suppressor cells. Cancer Immunol. Immunother. 58, 687-697. Nam, S, Kang, K, Cha, JS, Kim, JW, Lee, HG, Kim, Y, Yang, Y, Lee, MS, and Lim, JS (2016). Interferon regulatory factor 4 (IRF4) controls myeloid-derived suppressor cell (MDSC) differentiation and function. J. Leukoc. Biol. 100, 1273-1284. Poschke, I, Mougiakakos, D, Hansson, J, Masucci, GV, and Kiessling, R (2010). Immature immunosuppressive CD14+HLADR−/low cells in melanoma patients are Stat3hi and overexpress CD80, CD83, and DC-sign. Cancer Res. 70, 4335-4345. Robertson, SE, Young, JD, Kitson, S, Pitt, A, Evans, J, Roes, J, Karaoglu, D, Santora, L, Ghayur, T, Liew, FY, Gracie, JA, and McInnes, IB (2006). Expression and alternative processing of IL-18 in human neutrophils. Eur. J. Immunol. 36, 722-731. Said, EA, Dupuy, FP, Trautmann, L, Zhang, Y, Shi, Y, El-Far, M, Hill, BJ, Noto, A, Ancuta, P, Peretz, Y, Fonseca, SG, Van Grevenynghe, J, Boulassel, MR, Bruneau, J, Shoukry, NH, Routy, JP, Douek, DC, Haddad, EK, and Sekaly, RP (2010). Programmed death-1-induced interleukin-10 production by monocytes impairs CD4+ T cell activation during HIV infection. Nat. Med. 16, 452-459. Shin, J, and Jin, M (2017). Potential immunotherapeutics for immunosuppression in sepsis. Biomol. Ther. (Seoul). 25, 569-577. Sinha, P, Okoro, C, Foell, D, Freeze, HH, Ostrand-Rosenberg, S, and Srikrishna, G (2008). Proinflammatory S100 proteins regulate the accumulation of myeloid-derived suppressor cells. J. Immunol. 181, 4666-4675. Terme, M, Ullrich, E, Aymeric, L, Meinhardt, K, Desbois, M, Delahaye, N, Viaud, S, Ryffel, B, Yagita, H, Kaplanski, G, Prevost-Blondel, A, Kato, M, Schultze, JL, Tartour, E, Kroemer, G, Chaput, N, and Zitvogel, L (2011). 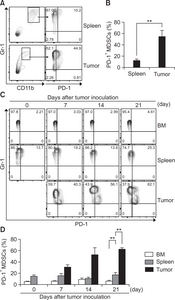 IL-18 induces PD-1-dependent immunosuppression in cancer. Cancer Res. 71, 5393-5399. Trikha, P, and Carson, WE (2014). Signaling pathways involved in MDSC regulation. Biochim. Biophys. Acta. 1846, 55-65. Tu, S, Bhagat, G, Cui, G, Takaishi, S, Kurt-Jones, EA, Rickman, B, Betz, KS, Penz-Oesterreicher, M, Bjorkdahl, O, Fox, JG, and Wang, TC (2008). Overexpression of interleukin-1beta induces gastric inflammation and cancer and mobilizes myeloid-derived suppressor cells in mice. Cancer Cell. 14, 408-419. Umansky, V, Blattner, C, Gebhardt, C, and Utikal, J (2016). The role of myeloid-derived suppressor cells (MDSC) in cancer progression. Vaccines (Basel). 4, E36. Yamazaki, T, Akiba, H, Iwai, H, Matsuda, H, Aoki, M, Tanno, Y, Shin, T, Tsuchiya, H, Pardoll, DM, Okumura, K, Azuma, M, and Yagita, H (2002). Expression of programmed death 1 ligands by murine T cells and APC. J. Immunol. 169, 5538-5545. Yang, L, and Zhang, Y (2017). Tumor-associated macrophages: from basic research to clinical application. J. Hematol. Oncol. 10, 58. Yang, R, Cai, Z, Zhang, Y, Yutzy, WHt, Roby, KF, and Roden, RB (2006). CD80 in immune suppression by mouse ovarian carcinoma-associated Gr-1+CD11b+ myeloid cells. Cancer Res. 66, 6807-6815. Yao, S, Wang, S, Zhu, Y, Luo, L, Zhu, G, Flies, S, Xu, H, Ruff, W, Broadwater, M, Choi, IH, Tamada, K, and Chen, L (2009). 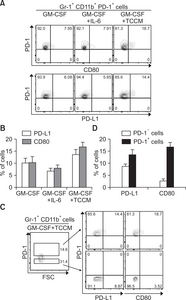 PD-1 on dendritic cells impedes innate immunity against bacterial infection. Blood. 113, 5811-5818. Zamani, MR, Aslani, S, Salmaninejad, A, Javan, MR, and Rezaei, N (2016). PD-1/PD-L and autoimmunity: a growing relationship. Cell Immunol. 310, 27-41. Zhang, Y, Zhou, Y, Lou, J, Li, J, Bo, L, Zhu, K, Wan, X, Deng, X, and Cai, Z (2010). PD-L1 blockade improves survival in experimental sepsis by inhibiting lymphocyte apoptosis and reversing monocyte dysfunction. CritCare. 14, R220.